A brand new card game from The Word Finder! 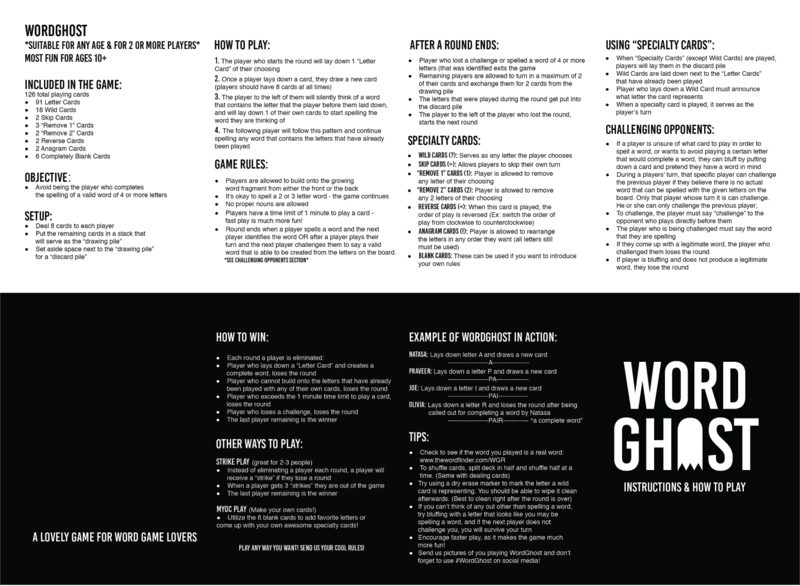 WordGhost is the card game that turned a childhood car game into a game night favorite. The game combines vocabulary with competition to create a perfect source of entertainment for any occasion. Turning the car game into a card game made it possible to add more features that add to the excitement. With new cards such as the “remove 2” card and the “anagram” card, the game has twists and turns you won’t see coming! We are passionate about words and are super excited to introduce Word Ghost! The game can be played by any number of people at any age. The objective of the game is to use your letters to continually create a word without ever finishing that word. Each player will begin with “letter cards” in their hand and one by one will place a letter down in order to spell a word they have in their head. The word must be four letters long to be considered a knockout word. This means 1-3 letter words are fine to play. If a player is caught completing a word, he or she is out. The game gets interesting when introducing the “special cards.” These cards are incorporated into the card game because it changes the dynamic of the game and the word(s) being played. The “special cards” consist of wild cards, skip cards, reverse cards, “remove 1” cards, “remove 2” cards, and anagram cards. The wild card allows the player to play any letter of your choosing, the skip card allows a player to skip their own turn, and the reverse card allows the player to reverse the order of the game. The “remove 1” card allows the player to remove one letter from the word and the “remove 2” card allows the player to remove two letters from the word. When using the removal cards, the player must pull all the letters together without reordering. The anagram card allows the player to rearrange all the letters to create a part of a new word. The letters still cannot form a word, or that player is out. Another competitive aspect of the game is the “challenge.” The challenge is used when a player thinks their opponent that plays directly before them is spelling a fake word. In this situation, the player can say: “challenge” to their opponent and that player must say the word he or she was spelling. If the word is valid, the player that called the challenge is out and if the word is not valid, the challenged player is out. 1) The “strike play” method allows the players to use a strike system instead of an instant elimination. Think of it like playing “HORSE” on a basketball court. When a player spells a word, he or she will get a strike and when that player collects three strikes, then he or she is out. 2) The “timed play” method calls for a timer that will only give the players a certain amount of time to play their letter or they automatically lose. This game will challenge your vocabulary and your ability to stay one step ahead of your opponents. It is the perfect game for a quiet night in or to be the center of game night.